A quick heads-up about a brief update I've made to the MARVEL TEAM-UP (UK weekly) entry. I spotted a news story in the UK fanzine BEM (issue 29, August 1980) which describes the upcoming new Marvel weekly SPIDER-MAN AND THE SUPER-HEROES. Marvel's mandarins clearly decided that having two Spider-man weeklies (as well as the Pocket Book and the occasional specials and annuals) was a recipe for confusion amongst readers and retailers and opted for a last-minute name change. 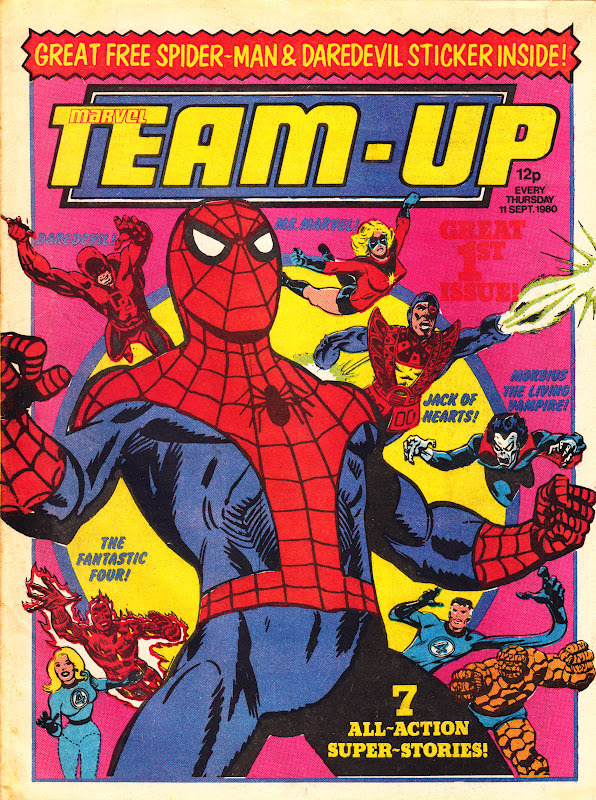 The existing Spidey comic was currently in its SPIDER-MAN AND HULK WEEKLY phase but the planned new launch did sound awfully similar to its SUPER SPIDER-MAN AND THE SUPER-HEROES era (issues 158 - 198, 21 February 1976 - 24 November 1976) which might have confused readers and newsagents with a long memory! See here for more on the UK edition of MARVEL TEAM-UP.